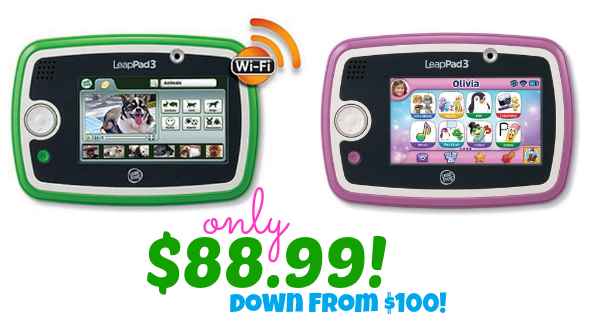 LeapFrog LeapPad3 Learning Tablets $88.99 + FREE Shipping + FREE Store Pickup (Reg. $100)! You are here: Home / Great Deals / LeapFrog LeapPad3 Learning Tablets $88.99 + FREE Shipping + FREE Store Pickup (Reg. $100)! Hurry and snag a green or pink/purple LeapFrog LeapPad3 Learning Tablet for ONLY $88.99 + FREE Shipping + FREE Store Pickup (Reg. $100)! To get it in time for Christmas, I would just select store pickup! What an amazing price for these right now!